I’ve written before about poetry as an art made from sound, and much of the past few days has been alive with the sound of poems. On Thursday night I gave a talk on contemporary poetry at St Helen and St Katharine school before their annual Literature Society dinner (held jointly with Abingdon boys’ school). In spite of being the only thing that stood between a room full of sixth formers and their dinner, I was blessed with an attentive and engaging audience: lots of intelligent questions, genuine enthusiasm for the poems, and not a yawn in sight. After a preamble about the importance of sound patterns (involving 60+ teenagers closing their eyes and listening – really listening – to the final lines of Briggflatts), we rattled through a selection of contemporary poems to illustrate the range and diversity of what’s currently being written. The common theme was sound: poetry as spoken music, communicating before it is understood. 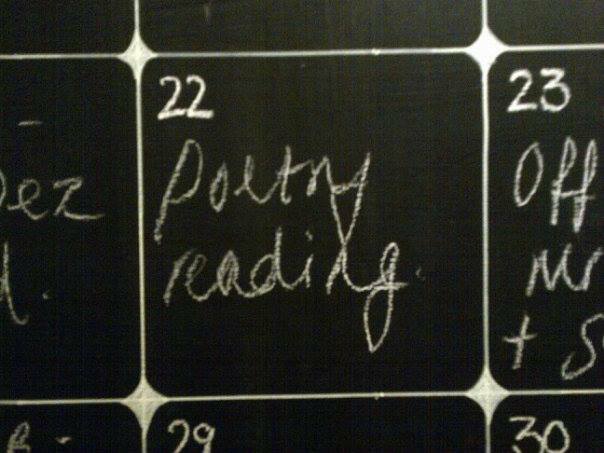 Over dinner I got into a conversation with some of the teachers about the value of learning poems by heart and/or reading them aloud – things that our current exam system doesn’t really value, but that make a big difference to how we appreciate poetry. I left with the echoes of good conversation alternating with the echoes of good poems in my ear. It was an ideal precursor to last night’s multi-poet reading at the Jericho Tavern in Oxford. I was delighted with the turn-out (with barely a spare chair in the house by 7pm) and grateful to the many people who helped spread the word. The Jericho is a great venue, with a stage-and-mic setup that’s designed for music gigs but perfect for poetry. 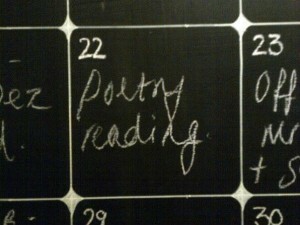 On the events calendar our poetry reading was chalked up in the midst of bands and music nights. The poets read wonderfully: Ben Parker sonorous; Claire Trévien somehow intense and relaxed at the same time; Patrick McGuinness layered and perfectly timed; Jenny Lewis wowing us with a fabulous rendition of Gilgamesh’s lament; James Methven darkly hilarious and poignant; and Fiona Sampson bringing Coleshill alive with a haunting range of cadences. As an unscheduled bonus, Foyle Young Poet Dominic Hand gave a superb reading of his prizewinning poem “An Interior Scene”. In short, a wealth of spoken music. Moving through the bustle afterwards I kept hearing variations on “I don’t normally go to poetry readings, but…”, followed by genuine enthusiasm for what people had just heard. Several bought a poetry book for the first time. So: a big thank-you to all of the poets who read, but also to everyone who came to listen (whether it was your first poetry reading or your fiftieth). Poetry is an art made from sound, and sound is only really sound when it’s heard.